Both travel and translation involve a type of journey, one with literal and metaphorical dimensions. Judith Johnston brings together these two richly resonant modes of getting from here to there as she explores their impact on culture with respect to the work of Victorian women. Using the metaphor of the published journey, whether it involves actual travel or translation, Johnston focusses particularly on the relationships of various British women with continental Europe. At the same time, she sheds light on the possibility of appropriation and British imperial enhancement that such contact produces. 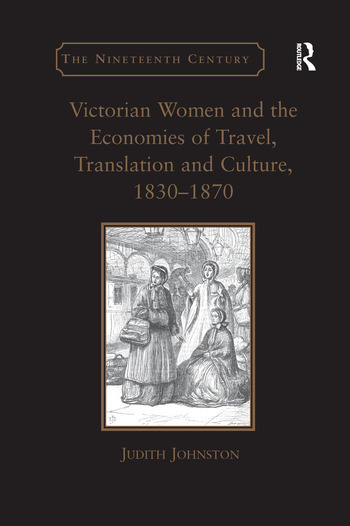 Johnston's book is in part devoted to case studies of women such as Sarah Austin, Mary Busk, Anna Jameson, Charlotte Guest, Jane Sinnett and Mary Howitt who are representative of women travellers, translators and journalists during a period when women became increasingly robust participants in the publishing industry. Whether they wrote about their own travels or translated the foreign language texts of other writers, Johnston shows, women were establishing themselves as actors in the broad business of culture. In widening our understanding of the ways in which gender and modernity functioned in the early decades of the Victorian age, Johnston's book makes a strong case for a greater appreciation of the contributions nineteenth-century women made to what is termed the knowledge empire. Contents: Preface; Introduction; Part I Historical and Theoretical Background: Travel, translation and culture: unexpected neighbourhoods. Part II Case Studies: Sarah Austin and the politics of translation; Mary Margaret Busk and the business of culture; Anna Jameson’s sentimental journey elsewhere; Charlotte Guest, Wales and cultural appropriation; Jane Sinnett and the German traveler; Emancipatory politics: Mary Howitt translates Fredrika Bremer; Bibliography; Index. Judith Johnston taught at the University of Western Australia and is now an Honorary Associate at the University of Sydney.